Ramen noodles have been on the rise for the last few years and now, they're absolutely skyrocketing. Declared as one of the top 11 trends at the 2016 NRA Show, ramen is sparking excitement with its seemingly limitless range of possibilities. Because ramen provides an incredibly customizable noodle-in-broth base, chefs from coast to coast are using it to craft adventurous, comforting, creative and healthful dishes. Tex-Mex ramen, lobster ramen, breakfast ramen, vegetarian ramen, beer bacon ramen -- look at nearly any locale and you'll find new and unique uses of the Japanese noodle. Some restaurants have even used it on top of burgers or as a side with salmon. And with the rise of more unexpected uses of ramen, consumers are more open to the traditional forms too, such as tonkotsu, miso, and shio. 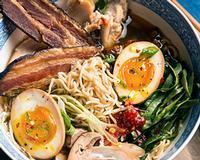 So, whether you're looking to go classic or creative, ramen is the hottest noodle right now. "While once the ramen trend was relegated to big cities like L.A. or New York, or smaller hipster enclaves like Portland or Austin, ramen is now all over the place." - Eater, "The 14 Hottest Ramen Shops Across the U.S. Right Now"